There has to be a better way of tapping a lightning bolt than flying a kite in a storm, and a group of French and German scientists just may have found one. They have demonstrated in a laboratory that shining powerful laser pulses between two electrodes elicits a controllable form of lightning. They hope that their invention will eventually help to fend off lightning strikes on airports and power stations. They employed their Teramobile laser, whose pulse lasts for a mere 100 femtoseconds and packs a peak power of 5 terawatts. The pulse rips the electrons from air molecules, creating a plasma; it also changes the refractive index of the air, a phenomenon called the Kerr effect. The effect focuses the light just enough to balance plasma-induced diffraction, creating a straight and highly conductive channel, called a filament, which can stretch up to 3.8 meters between the charged electrodes. In the experiment, a 1- to 2-megavolt electrode simulates a thundercloud and an electrically grounded plate simulates the earth. The laser-induced filaments short-circuit the electrodes, triggering an electric discharge much like a lightning bolt. To complete the simulation, the researchers sprayed water between the electrodes. "We expected that the 'rainwater' would scatter light and perturb the filaments, but the filaments survived the interaction," says Jérôme Kasparian, a lead investigator and a member of the group from the University of Lyon, in France. Another team hails from the École Polytechnique, in Palaiseau, France; two others come from the Free University of Berlin and the Friedrich Schiller University, in Jena, Germany. The main problem is the plasma's milliseconds-long life, which limits the distance between the two electrodes to 10 meters. Kasparian says that the research groups hope to keep the plasma going longer by heating it with a second laser. Still, they are far from getting filaments that could span the 5 to 6 kilometers separating a thundercloud from the earth. 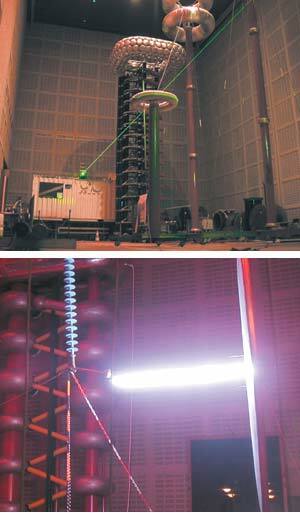 FILAMENT OF FIRE: The Teramobile laser [right] shoots pulses from a shed to the space between an electrode charged by a generating tower and a grounded electrode [not shown]. The pulse ionizes the air, creating a conductive filament. Artificial lightning follows the filament's straight path [below]. Scientists have tried and failed to manipulate lightning with lasers for 20 years. One reason, Kasparian says, is that all experiments so far have employed lasers with relatively long pulses of high energy, which create plasmas so dense that they scatter the laser light, preventing the formation of a filament. The Franco-German team solved this problem with the Teramobile, the first mobile laser ever to emit ultrashort pulses of moderate energy. The titanium-sapphire laser was designed to track air pollution by analyzing light that bounces off atmospheric gases, but the researchers realized that it could also provide lightning "on demand." Matters don't seem that simple to Martin Uman, director of the Lightning Research Laboratory at the University of Florida, in Gainesville. Every summer for 11 years, he and his group have launched about 70 rockets trailing grounded wire into thunderclouds, drawing lightning half the time. "The cloud charges itself back up in about 10 seconds. You don't know if you're going to put the rocket [or the laser beam] in the right place," he says. "Firing lasers or rockets is not going to make any difference to what's going on up there. You probably have to go a step further back and understand the physics behind it." To understand lightning, however, you need to be able to produce it reliably and frequently, and here lasers might have advantages over rockets. Typical rocket racks allow only up to 10 launches, Kasparian points out, while the laser technique could provide a "virtually unlimited number of shots" at triggering lightning. If lasers ever write glowing lines high in the sky, it should be possible to control the course of lightning bolts. Then people will not merely talk about the weather, but do something about it.